MANCHESTER, N.H. - When Barbara and David Stahl started collecting prints in the mid 1950s, they had a rule: “Under $100 either of us could decide alone. Over $100 there had to be agreement,’’ writes David Stahl in his catalog essay for “Evolution of a Shared Vision: The David and Barbara Stahl Collection,’’ an exhibit now up at the Currier Museum of Art. They acquired, over the decades, between 400 and 500 prints, according to exhibition curator Kurt Sundstrom. “Evolution of a Shared Vision’’ highlights just over 100 of them. The collection’s strengths lie in works from the early part of the 20th century, especially German Expressionist prints (the list includes George Grosz and Max Beckmann) and the social realism of Americans such as Edward Hopper, Reginald Marsh, and John Sloan. Even so, the Stahls did not limit themselves to one era or style; the collection includes works by Rembrandt, Piranesi, Whistler, and Picasso, and it also steps right into the 21st century. Most of the prints do not flinch from suffering. It’s a dark, stirring, technically strong group of works, occasionally leavened by a touch of romance or a wash of color. The Stahls began acquiring prints when they moved into a larger home with their small children and found plenty of empty wall space. Barbara, a longtime professor of biology at Saint Anselm College who died in 2004, initially argued for color, while David, a Manchester dentist, preferred black and white. David won out. Their first purchases, however, were colorful, if moody. They were two of Georges Rouault’s aquatint etchings from “Le Cirque,’’ a gorgeous series of eight prints made in 1930 and 1931. Over the years the Stahls acquired them all; David purchased the last (and Rouault’s first plate of the group), “Amazone (The Amazon)’’ in 2006. 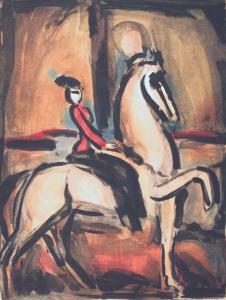 In several graceful S curves, Rouault portrays a rider on a horse. For Rouault, the circus was a metaphor for life: We all apply greasepaint and put on a show. The “Le Cirque’’ prints depict the performers in the murky glow of stage lights, a suffocating atmosphere, yet the performers soldier on. The exhibit hopscotches from era to era. Gems along the way stand out, slowing what can seem like a relentless rush through time. Albrecht Dürer’s brilliant woodcut “Harrowing of Hell,’’ from his 1509 series “Small Passion,’’ technically startling in its delicacy and compelling in its narrative content, features Christ releasing inhabitants from limbo, including Adam, Eve, John the Baptist, and Moses. The wall of German Expressionist prints includes “The Hero,’’ George Grosz’s scathing 1933 lithograph depicting a broken man clutching flowers - an amputee with a crutch and a face disfigured by scars, probably a veteran of World War I. Conrad Felixmüller, generally thought to be less acidic with his social commentary than his contemporaries, has a 1920 woodcut self-portrait here that is built from bold lines, except for the white circles that ring his eyes. The artist glitters like a dark star; it’s a strong, brutal portrait. The Americans of that era sought to convey the small details of city life. John Sloan’s 1914 etching “Love on the Roof,’’ in which a couple embrace amid the laundry flapping on the clothesline, with a toddler playing at the clothes basket, has a gritty charm. Reginald Marsh’s stark, Depression-era etching and engraving has more bite: “Bread Line, No One Has Starved,’’ shows a row of men in long coats, shoulders slumped, waiting for food. Edward Hopper is best known for his paintings, but he turned to etching during a lull early in his career. His 1921 etching “Night Shadows’’ captures Hopper’s familiar theme of urban isolation. It’s a street scene depicted from above; a lone figure walks along a broad sidewalk. The shadow of a pole juts ominously across his path, and a corner building seems, at this angle, to loom threateningly above him. More recent works include Peter Milton’s remarkable 1991 etching and engraving “The Train From Munich,’’ an ambitious, surreal narrative about a British effort in 1939 to rescue Jewish children from Nazi Germany. It’s technically virtuosic and packed with magical realist storytelling, as shadows, sparkles, and transparent ghosts move through a train station. At the center is a girl, one of the refugees - who grew up to be Milton’s wife - looking directly at the viewer. The rare color images strive to fit in among the brooding storytelling of the Stahls’ black-and-white prints. Robert S. Neuman’s 1989 “Lame Deer Study,’’ a warm, burbling watercolor of an abstracted landscape (and the catalog’s cover image) is particularly out of place. The Stahls’ collection, while dark, does not call for bright respites. The threads of humanity and compassion that run through this often searing exhibition provide comfort enough.